BEIJING - A toddler who was twice run over by vans and then ignored by passers-by on a busy market street died Friday a week after the accident and after days of bitter soul-searching over declining morality in China. The Guangzhou Military District General Hospital said that the 2-year-old girl, Wang Yue, died shortly after midnight of brain and organ failure. "Her injuries were too severe and the treatment had no effect," intensive care unit director Su Lei told reporters. The plight of the child, nicknamed Yueyue, came to symbolize what many Chinese see as a decay in public morals after heady decades of economic growth and rising prosperity. 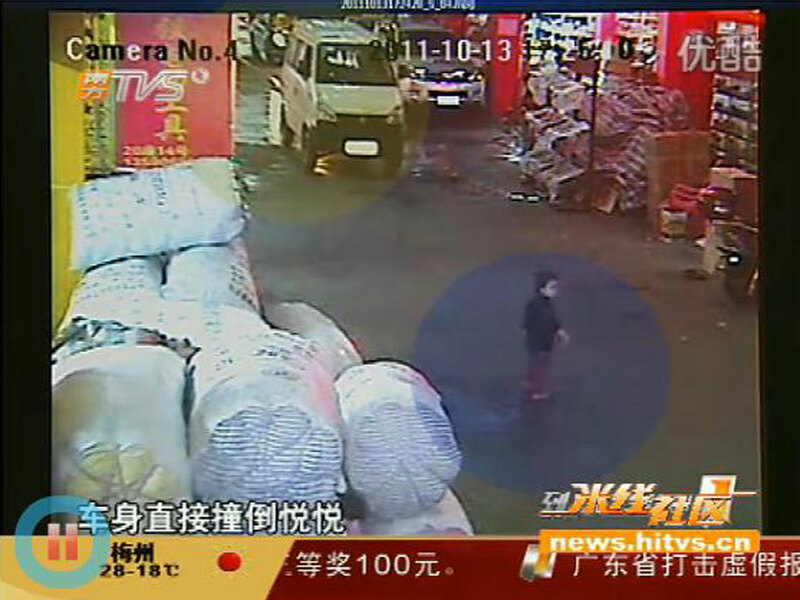 Gruesome closed-circuit camera video of last Thursday's accident, aired on television and posted on the Internet, showed Yueyue toddling along the hardware market street in the southern city of Foshan. A van strikes her, slows and then resumes driving, rolling its back right wheel over the child. As she lays with blood pooling, 18 people walk or cycle by and another van strikes her before a scrap picker scoops her up. Yueyue's death touched off another round of hand-wringing about society and personal responsibility. Many comments posted to social media sites said "we are all passers-by." Li Xiangping, a professor of religion at Huadong University, said on a Twitter-like service that it is too easy to blame others. "What after all prompted such a sad phenomenon? Officials? The rich? Or is it our own cold-heartedness?" Li said on Sina Corp.'s Weibo. Police have detained the drivers of both vans on suspicion of causing a traffic accident but have not said what formal charges they would face and if manslaughter would be among them now that the girl has died. The people who could be seen on the video passing by the injured Yueyue have recounted being harassed for ignoring her. The respected Southern Metropolis Daily newspaper quoted a man it identified only as a hardware merchant Mr. Chen as saying that he had been receiving crank calls ever since someone picked him out as the 16th passer-by. He said he hadn't noticed the child. Some experts said an unwillingness to help others is an outgrowth of urbanization as migrants pour into cities and create neighborhoods of strangers. "Rapid urbanization not only affects China or Foshan, but anywhere in the world where you have a lot of high-rise buildings, where there is high population density, then the relationship with the neighbors, and with each other is affected," said Yao Yue, a psychologist and director of telephone help-line for distressed people in Beijing.